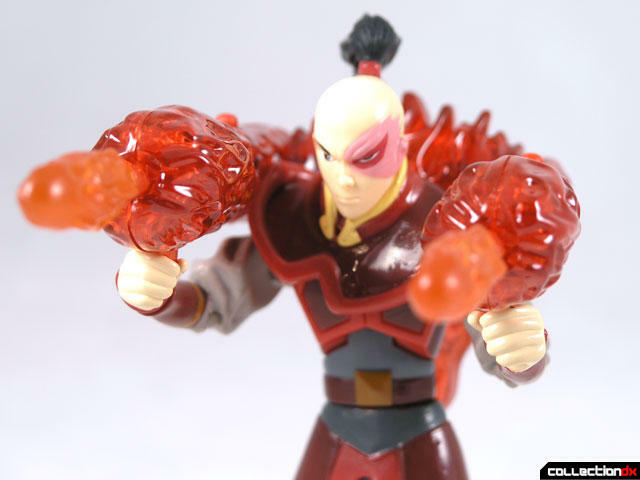 Fire Blast Zuko comes from the Nick Show Avatar: The Last Airbender. Prince Zuko is the son of the Fire Lord. He has been exiled and once was driven to find and capture the Avatar. Now, he is a refugee in the city of Ba Sing Se. This version of Zuko shows him in his military gear, before he became a refugee and cut his hair. This is a perfect representation of Zuko, right down to the scar on his face. 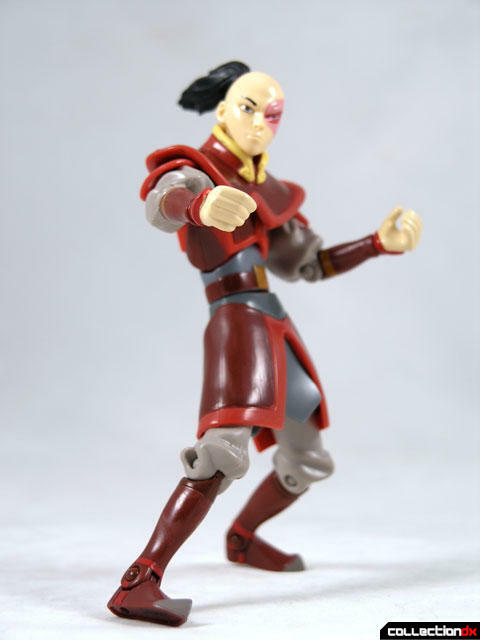 Like the Aang figure, the Zuko figure has rubber clothing to enable more realistic movements. The figure is very poseable, and just looks fantastic. He's a bit taller than Aang, which is true to the show (I think Zuko is 3 years older than Aang). 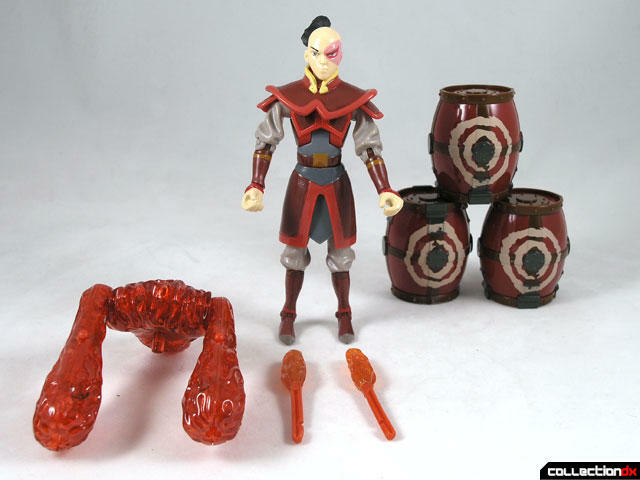 Fire Blast Zuko comes with a Fire Blast accessory that attaches to his back. It is similar to Aang's Air cannon, only colored red and has fire-based detailing. Like Aang's cannon, this one shoots missiles and has a light up feature. 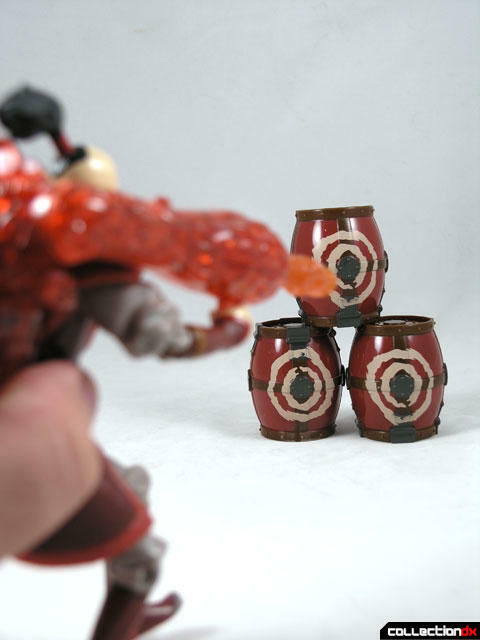 Also included are three target barrels. The missile launchers are weak, so you have to get pretty close to the barrels to knock them over. This is probably the best figure from this line so far. The likeness is uncanny. Good Job Mattel.